Outlook Converter Software convert all items related to PST file such as Emails, Tasks, Contacts, Journal into single MBOX file supported by different emails clients. Outlook To MBOX Converter software is designed in such a way that a non-technical user can easily manage to convert PST File into MBOX file format. The user interface has single panel, thereby provides simplicity in understanding the options for the conversion. The PST to MBOX Converter provides the option to keep the folder hierarchy same. If you like to keep the hierarchy maintained, then select "Yes" option otherwise you can select "no" option, if you don't maintain the structure of the folder.. The software produces an output MBOX file, which is compatible with all email clients like Thunderbird, Apple mail, Eudora, etc. It creates a new MBOX file after conversion and easily exportable to other desktop e-mail clients. 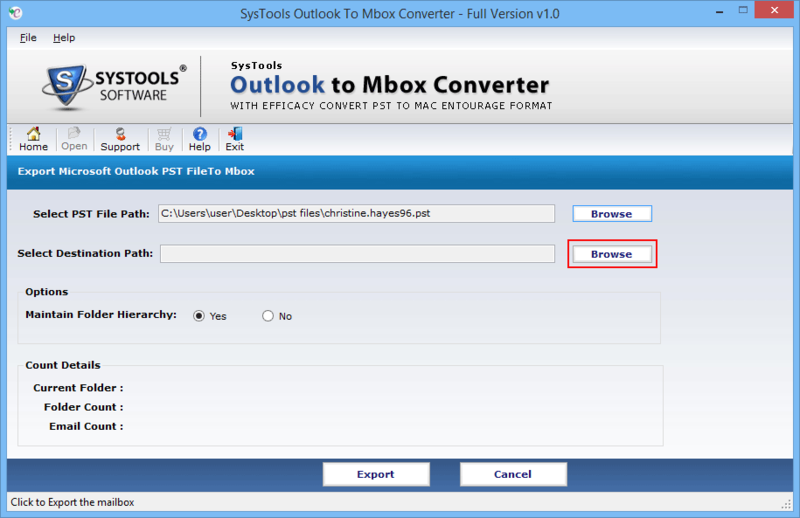 Outlook to MBOX Converter always retain the data from files and never alter any metadata associated such as dates, attachments, contacts of the files. Software does not try to change the original data of PST files. A Trustworthy tool, which converts single Outlook PST File into MBOX File. Different from tool available on market, single panel interfaces help user to easily to convert all emails, contacts, tasks, details into a single mailbox file, that can be easily used by other email clients. The user can maintain the hierarchy of Mailbox structure. Software preserves metadata related to all mailbox files to PST files and do not change any kind of information during the conversion process. Today people are using different email client such as Thunderbird, Endura, Apple mail application for Email management, Since these email clients user MBOX file to store their emails and data management and no direct method to convert PST file in MBOX format and manual method are lengthy and time-consumingprocessed, To solve all these kind issues and quickly convert Outlook file in Thunderbird format,user can go for MBOX Converter. Run PST to MBOX Converter. To add file within software, click on "Open" option. Now browse the location of PST File within configured system to select PST file path. After selecting desired PST File, Click on Browse option to Select the Destination Path..
PST to MBOX Converter provides option to Maintain Hierarchy of folder in output file, Click "Yes" to maintain folder Hierarchy. Click on "Export" option to start the process of Conversion from PST To MBOX file format. A Windows pop up with message "Conversion is completed", click "OK". Now view the Converted MBOX File in Stored location. Replies To All Doubts & Queries Related To Tool! Is the software able to convert corrupt or damaged PST file in another format? No, Software works only on healthy or non-corrupted PST Files. To convert to MBOX Format, first of all you have to repair damaged files, and remove the password if any. Can PST To MBOX Converter can convert multiples PST files in one go? Software convert only single PST file at a time. It does not convert PST file in bulk. Is it necessary to install MS Outlook to run software smoothly? Yes, To run the software on conversion machine, MS Outlook application (32-bit) installed properly with configured account. 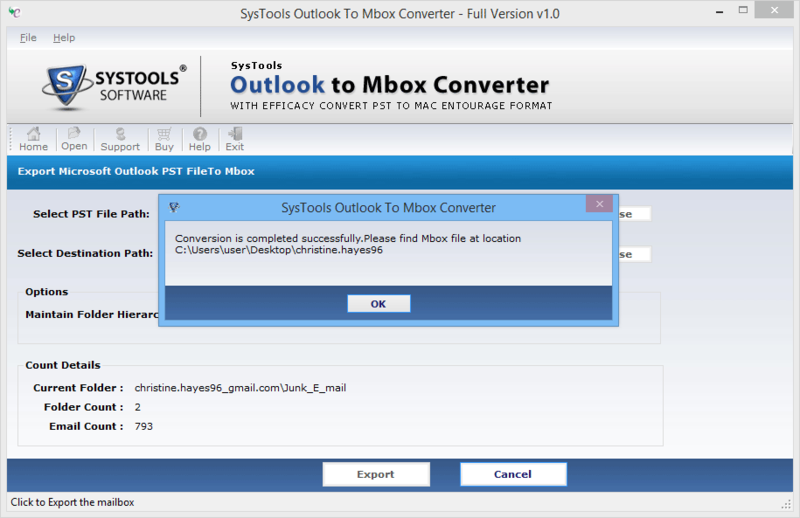 Highly impressed by this PST To MBOX converter tool, convert PST file in MBOX format file, which are exportable to other email clients, my all data are intact, the software doesn't change in my PST data files. Simple and user-friendly interface for a novice user like me, which help me a lot to convert PST file in MBOX format, without a help of any technical person. No compatibility issues with resulted output files, easily convert very large PST file into a single mailbox file, tool got all features for conversion of email data.Fully satisfied with its techniques. 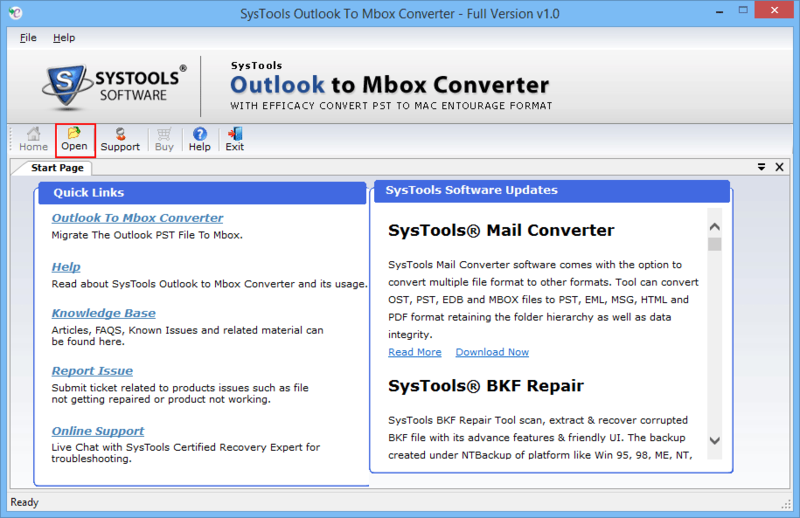 Easy to use software, no long process to convert Outlook PST into MBOX format, supported by various emails clients. Just load the file into the software, within in few clicks, you are able to view converted MBOX file.